Last week while I was grocery shopping I was heading down my favourite aisle (baking!) when I passed a giant wall of Oreos at the end of the aisle. They were on sale for $1 each. Score. I'm sure normal peoples first thought would have been, "Yum, Oreos". Mine was, "Yay, cupcakes!" I grabbed a box of the strawberry ones and chucked them in the trolley. It took me a while to decide on what I wanted to do. My initial thought had been cupcakes, perhaps buttercakes baked with fresh strawberries inside. But in the end I went for something a little different. I've never actually had strawberry Oreos before. Oreos aren't exactly my favourite biscuit in the world. 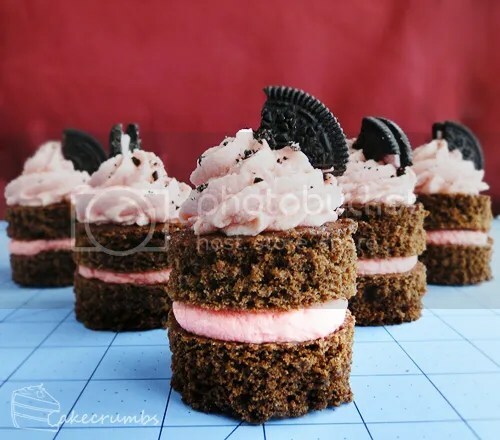 There are so many Australian cream biscuits that are just to die for that I've never turned to Oreos unless in need of that lovely dark colour for something like a cheesecake base. But strawberry. Anything with strawberry and I am hooked. I decided I wanted to mimic the aesthetic of the oreo itself. So I baked a sheet of mudcake and used a fluted cutter to represent the crimped edge of the biscuit. Though the cake is so moist the patterns were less obvious after a bit of handling. 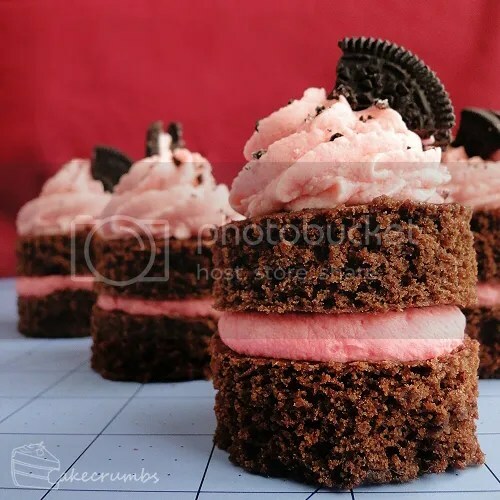 I then layered the cakes with strawberry cream, topped it with a little strawberry buttercream and then finally decorated with segments of Oreos and crumbs. 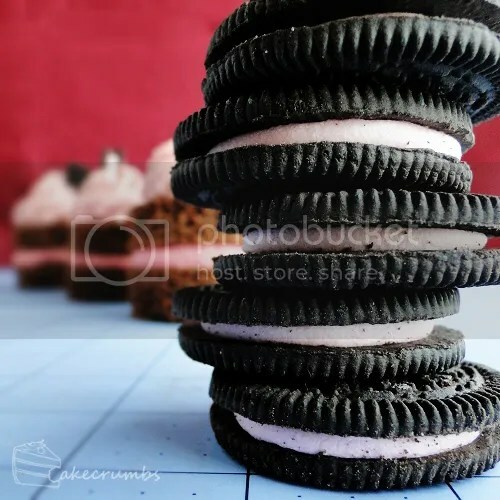 They're too tall to fit into your mouth in one go, so disassembling them like an Oreo is half the fun. If you can get your hands on a good strawberry essence it will make these cakes something special. I use the Queens brand and love the flavour. When I took these out of their container today for photos, I got this lovely waft of strawberry that smelled so much like the strawberry in Neapolitan ice cream. It reminded me of how I needed to use it more often. Here's how I did it. This recipe makes 6-8 cakes, depending on the size of your cutter. Grease and line a lamington tin. Preheat oven to 160°C (140°C fan forced/325°F). Melt chocolate; leave to cool slightly. Meanwhile, beat butter, sugar and cocoa together until smooth and creamy. Beat in egg. Pour in melted chocolate and stir lightly to combine. Heat milk and water together (40 seconds in the microwave will be plenty). Fold in a third of the flour and fold into the mixture, then do the same with half of the milk mixture. Repeat until all ingredients have been incorporated into the batter, finishing with the flour. Combine the ingredients and whip to stiff peaks. 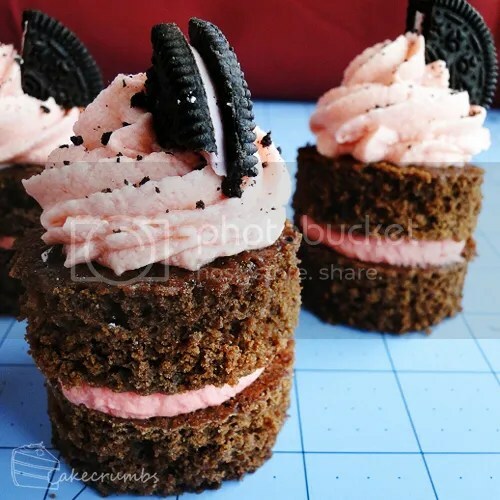 The strawberry essence will give both the cream and buttercream some colour, but if you want the pink to be richer, add a few drops of pink food colouring and beat in to the mixture. Beat the butter until light and fluffy. Beat in milk and strawberry essence; gradually beat in icing sugar until well combined. *NB: As this is a new recipe and I've only made it once, keep an eye on the cake. Everyone's oven behaves differently and I did open the oven door to check this a few times towards the end as I expected it to take 20 minutes, so I would have lost some heat and extended the baking time. The cake will be ready when it springs back when touched (or when a toothpick inserted comes out clean). If you find the cooking time is much different, please let me know. 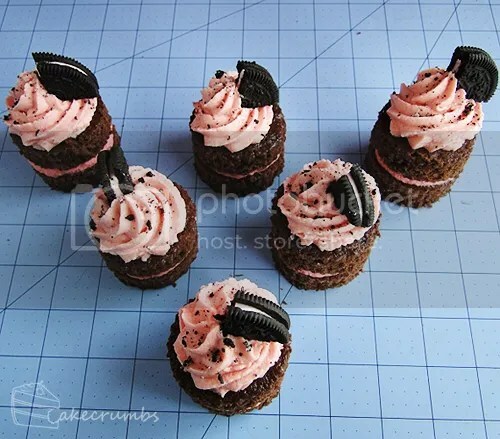 These looks very delicious! I like the photos on the cutting board – gives them a nice effect. Love this! 😀 So simple and they look incredibly professional. Thanks! Gotta love a dessert you can churn out quickly. How to choose! I’m a fan of most anything Arnotts make — they sell packets of assorted cream biscuits and we usually all go nuts on those (except no one wants the monte carlos haha). My absolute favourite is the Kingstons, though. So good. Or the Shortbread Creams. There’s usually a good fight for both of those. They also have what I guess would be an Oreo equivalent in the Delta Creams. This looks immense! Definitely worth making for special occasions.